The best way to create a well-designed two-column publication in Publisher is to start with a template. 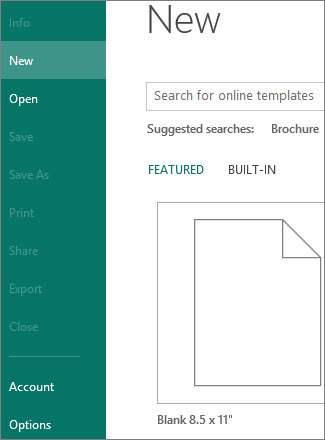 You’ll find Publisher templates on the Start page that appears when you open Publisher. You can also get to the Start page anytime by clicking File > New. If you still want to make a two-column brochure from scratch, follow these steps. Click File > New, and click a blank publication. Click Insert > Draw Text Box, and draw a text box that goes to the margins of the page. 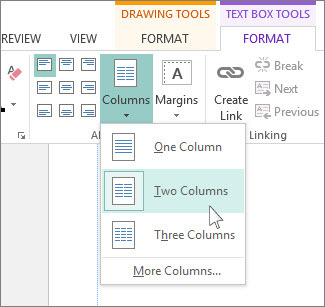 Make sure the text box is selected and click Text Box Tools Format > Columns > Two Columns. Type text and insert graphics to complete your two-column publication.